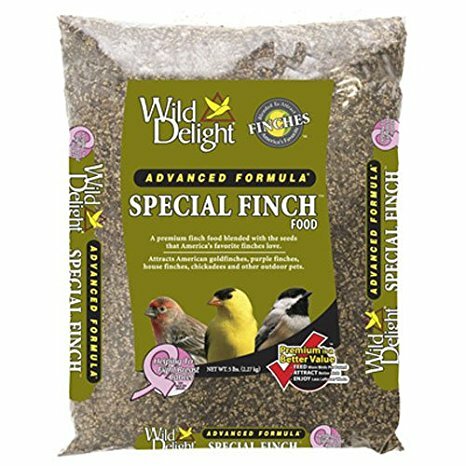 Special Finch Feed is a premium Finch food blended with the seeds that America’s favorite Finches love. American Goldfinches, Purple Finches, House Finches, Chickadees, Nuthatches, Titmice, Exotic Parakeets and other outdoor pets. *Nyjer® has been sterilized to help prevent germination. Nyjer® is a registered trademark of the Wild Bird Feeding Industry. Feed desired amount in a tube feeder with small holes, hopper feeder or platform feeder. Keep feeders full. Clean feeders frequently. Keep clean, fresh water available. Feed all year long. Sunflower Kernels, Niger Seed (Guizotia Abyssinica), Vitamin A Supplement, Vitamin D-3 Supplement, Vitamin E Supplement, Menadione Sodium Bisulfite Complex, Thiamine Mononitrate, Riboflavin, Niacin, Choline Chloride, Vitamin B12 Supplement, Pyridoxine Hydrochloride, Biotin, Folic Acid, Ascorbic Acid (Vitamin C), L-Lysine Monohydrochloride, DL-Methionine, Potassium Chloride, Sodium Bicarbonate, Manganous Oxide, Ferrous Sulfate, Copper Oxide, Calcium Iodate, Zinc Oxide, Magnesium Oxide, Dextrose, Artificial Flavor.